HP is planning to rule over the education market with their latest Intel-based Chromebook announcements. The HP Chromebook x360 11 G2 and HP Chromebook 11 G7 EE. HP plans on releasing these notebooks around April which is just the right time for tech vendors to release contrabands for school year buying cycle. Chromebooks being one of the most popular purchases for students and teachers could definitely use an upgrade like this in 2019. For instance, the HP Chromebook x360 11 G2 Education Edition is loaded with the latest Intel Celeron processors N4100 or N4000 and Intel UHD Graphics 600. Alongside is its claimed 11.5-hour battery life which if true, is hard to find standup average in budget notebooks. The device is also convertible, and the 360-degree hinge can hold up support in tablet, tent, stand and laptop modes. There is also an optional HP Wacom EMR pen, dual cameras, and support for type, touch, write, capture, and draw gestures as well. The device also dons a good port selection and contains USB-C ports on each side, a USB 3 Type-A port, a microSD card reader, a Headset jack, 802.11ac WiFi and Bluetooth 5.0. For the storage, HP has equipped this Chromebook with 64 GB eMMC storage and comes with 8GB of RAM for efficient multitasking. Additionally, it comes with a 2-year subscription to 100GB Google Drive which is a nice little bow to seal the package with. 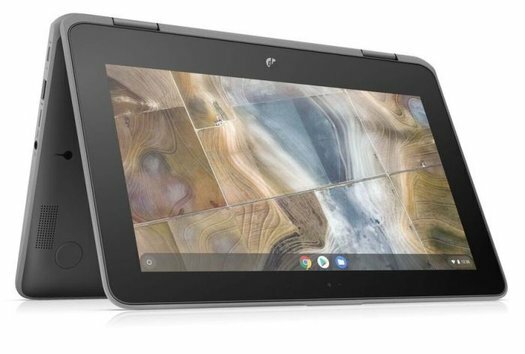 With the same convertibility, port selection and the 11.6-inch screen size as its sibling x360 11 G2, the Chromebook 11 G7 EE is a more traditional take in this lineup. What the 11 G7 EE doesn’t have is its sibling’s 5MP world facing camera while both hold a 720p front-facing webcam. However, it does weight lighter – reaching about 2.9 pounds, as opposed to the 3.2 pounds of the x360 11 G2. Another feature these both notebooks share is the configuration of processors and RAM, whereas the storage options in the G7 are available from 16GB to 64GB of eMMC 5.0 storage. But the most impressive upgrade made by HP is shared by both Chromebooks that is the military grade robustness. Not only is it an extremely hard feature to find in budget Chromebooks like these, but it’s an addition that no one expected to get. The Chromebooks sport a minor-spill-resistant keyboard, shock-absorbing body, and Corning Gorilla Glass protection. It can also withstand a 76-centimeter drop on concrete. We think that HP paid attention to the rough routine that students usually put their laptops through and devised a solution that holds not only powerful internals but also keeps good and strong shape on the outside as well. HP is yet to reveal the prices of these notebooks which will tell us a lot more about these upgrades, but until then, we can’t help but hope for it all to be good.